For some ALTs getting a driver’s license is fairly easy. For Americans, Jamaicans, and South Africans however, getting a Japanese license is a little more complicated and a lot more difficult. The reason why this is because Japan asked various countries to fill out a survey explaining the process of getting a license in their country – those that didn’t, or couldn’t were not given the easy ride. A valid foreign driver’s license. To have lived in the country where your driver’s license was issued for more than 3 months after obtaining it. If you have your license renewed within the 3 months before you leave for Japan it would be a very good idea to get a copy of your license transcripts or other official document so that you can prove you had your license for more than the 3 month period. At least a day of nenkyuu (but it usually takes a half-day) to turn in forms and make a test appointment. *Note: There is a possibility that you will take the driving exam on the same day as the written exam. Be prepared in case that happens. Reservations must be made in advance, expect a full day of nenkyuu to be used. STEP ONE: Call between the hours of 3PM and 5PM on a weekday to make your first appointment (0764-41-2211). This appointment will be to let them know you want to come in and turn in some paperwork to get started on getting your Japanese license. Your license can only be submitted for conversion Monday – Friday, 8.30 – 9.00 a.m. Please arrive early as you MUST present the forms at this time. If you arrive too late, your papers will not be accepted. If you do not have fluent Japanese ability (or at least around JLPT N3 level), you may need to take someone with you to act as a translator. From JR Toyama station, take a bus for Saiseikai Toyama Byouin, and get off at the Unten Kyouiku Centre. By car from Toyama, take Route 8 towards Namerikawa. Take a left at the turning with a large, pastel-colored, ribbon-like sculpture on one corner. From there continue straight until you see signs for the Alpine Stadium. The Unten Kyouiku Centre is beside the Stadium, so take a right for the stadium and then drive round past it. Take the first right turn, and you will see a large car park and building (the Unten Kyouiku) on the right. From Toyama Higashi JR Station exit, and immediately turn right past the bike racks. At the train crossing, turn right to cross the tracks and proceed straight down that road until you reach the intersection with the large pink hospital. Turn left and after about 10 minutes the driving school and driving center will be on your right. It’s about a 20-25 minute walk. 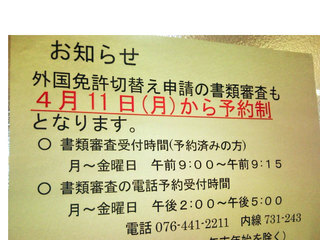 A copy of your proof of residency 住民票(Jyuuminhyou). There are two kinds – a short version and a detailed (細かいKomakai) version. Get the detailed version. You can get this from your city hall or local city center for a small fee (typically around 300 yen). Money: ¥2,400 – ¥3,400 application fee, ¥1,750 license issue fee, ¥1,000 membership fee of Driver’s Safety Foundation (optional). A Japanese translation of your (home country) driver’s license. This costs ¥3000. Your license must be translated by the administrative office which issued your license, or the Embassy / consulate of that country, or JAF (Japan Automobile Federation), Toyama office: 824-3 Akada, Toyama (tel. 0764 25-7373) – JAF is the easiest option! *Note: Make sure that your license has a section that indicates when your license was issued. The driving center needs to know when your license was issued. If it was renewed in the three months immediately prior to your arrival in Japan, make sure you have some proof that your license was issued before that last renewal date. In this case, a notarized driving record from your state’s DMV will suffice. Otherwise, you will be considered a new driver, and you will not be able to convert your license, but will have to apply for a new license. If you bring a separate form proving the date of issuance of your license, make sure to have someone translate it for you (you should be able to get away with an amateur translation of this form). **Additionally, some ALTs have reported needing more than just a passport to prove residency in their home country. Please be mindful that the DMV may require additional information such as original college transcripts or tax returns to prove former residency. You will take all the materials listed above by 8:20AM. Window 11, which is the window you want, will be open between 8:30AM and 9:00AM so don’t be late, because you’ll be turned away and have to go home and try again some other time, having wasted time off. A nice man will take all of your materials and give you some paperwork to fill out. We recommend bringing a native speaker with you if you feel you don’t have the abilities (a JLPT level 3 or higher) to do it on your own . After you complete the form, you’ll give it to the man and he’ll tell you to wait. You will proceed to wait for a while when he calls you back again. You’ll probably have to pay some fees at some point, and eventually you’ll go over to the eye exam area, and get your eyes checked. Once this is done, JETs not from the US, South Africa, or Jamaica will (probably after more waiting) receive their new Japanese license and they get to drive home happy. American JETs from Maryland are also excused from the driving test. The rest of us aren’t so lucky. And here for a very complete guide by the National Police Agency. Incidentally, the written test for a motorcycle license is 100 questions and much more challenging (it’s the same test distributed to Japanese drivers as well). First, we highly – HIGHLY – recommend taking driving lessons at the富山県交通安全協会 (Toyama-ken Koutsu Anzen Kyoukai, the Toyama Prefecture Traffic Safety Association. Phone number is 076-451-1851, address is富山県富山市下飯野６２ （財）Toyama-ken, Toyama-shi, Shimoino 62, zai) which is right around the corner from the DMV you went to to turn in your materials. Bring all of the forms you received when you handed in your materials at the DMV (these forms will be VERY IMPORTANT and necessary to take the driving test so do not lose them! ), along with your country’s license, international permit (if you have it), passport, and your residence card (存在カード) just in case (these are things you should be carrying on you at all times, anyway). Also, bring lots of cash. An appointment here costs around ￥5500 per one-hour lesson (although to be honest it’s more like 50 minutes), but this is only until 5PM. After 5PM, the cost goes up to around ￥6400 (this is for lessons from 5PM to 7PM, the last window of opportunity for the day). They are open Monday through Friday from 9AM to 7PM. They are not open on weekends or holidays. However, if you can find the time to take lessons, I highly recommend it. You might first have lessons on a practice course, but you’ll eventually practice on the actual courses for the driving test, and be able to practice for the test. The teachers also have a tendency to know what course will be for the test on certain days. One ALT was able to take lessons on Sundays, so please inquire about bi-weekly Sunday lessons if you are interested. This might seem like the expensive route – and it is expensive – but it’s easier to take hourly lessons and get a feel for the course before taking the test, and cheaper in terms of nenkyu, paid leave. I ended up taking seven lessons (probably three more than I needed, to be honest) and passed my first time. Others have not taken lessons and ended up re-taking the test seven or more times. This is not a typical driving test – it is designed to be memorized and mastered, and is not designed to test actual driving skill. So even if you’re a really good driver normally, you can easily fail this test. Which is why we’re recommending the lessons. It’s ultimately up to you, but I’m personally really glad I took the lessons – it made everything that much less stressful. In any case, once you feel ready to take the Driving Test, visit the DMV in advance between the hours of 3PM and 5PM (you must make your appointment AT the DMV! You can try to call but I was told I couldn’t make a phone appointment for the driving test)) and schedule your appointment for the practical test. The appointment for the driving test must be on a Monday, Wednesday, or Friday. Expect to take at least half a day (in some cases, a day) of nenkyu for the appointment, and make sure your school knows you’ll be gone. Congrats! You’re at the final stage – taking the Driving Test! Gather up all of your forms you received from the DMV along with your residency card, passport, etc, and also money (around ￥7000 to be safe, and have change for a coffee) and let’s go on to the Driving Test Guide!